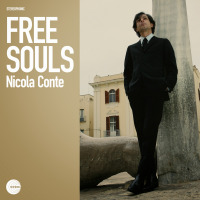 Italian guitarist, bandleader, crate digger and DJ Nicola Conte's journeys into musics originating from beyond Europebe they Brazilian, Hindustani, Latin American or Africansometimes carry a touch of the touristic about them, but his work is so transparently heartfelt that it never becomes a problem. It is also, always, superbly well crafted. 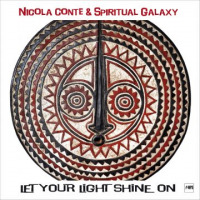 Conte identifies Let Your Light Shine On as a celebration of African American spiritual jazz. It is perhaps his strongest release since his acid-jazz masterpiece, Jet Sounds (Schema), in 2000. 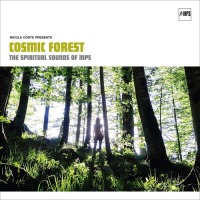 "You could call it spiritual or cosmic Afro-jazz," writes Conte in the publicity bumph accompanying the new album. "I'm interested in the Afrocentric approach that such artists as John Coltrane and such labels as Strata-East carried forward in the 1960s and 1970s. Music was a way of dealing with the problems of that time. 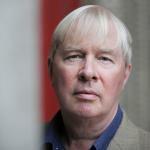 Music may well have a greater relevance today than ever beforemany problems have only gotten worse." Who would argue with Conte's sentiments? But do not look to Let You Light Shine On for the abrasive spiritual-jazz aesthetic which informed signature mid-1970s Strata-East albums such as Shamek Farrah's First Impressions, Billy Parker's Freedom Of Speech or JuJu's A Message From Mozambique. Conte's take on the style is lusher, plusher and less explicitly politically charged. It is, in fact, more groove-based soul-jazz than black-consciousness driven spiritual-jazz. But it is indisputably top-drawer jazz, and Conte's bandwhich includes Scandinavians, Italians, African Americans and African Caribbeans among its admirably cross-cultural lineupfeatures some great musicians. Particularly notable among them are singers Bridgette Amofah and British based Zara McFarlane, whose superb 2017 album Arise (Brownswood) was previously reviewed here, trumpeter Theo Croker, alto saxophonist Logan Richardson, tenor saxophonist Magnus Lindgren and trombonist Gianluca Petrella. The supposed crime of cultural appropriation has been levelled against world music since the 1980s, triggered by the big target offered by Paul Simon's Graceland (Warner Bros, 1986). It was a mean-spirited accusation then and is a frankly ludicrous one in 2018. In a world where everyone can listen to music from the most distant cultures via a few clicks on their phone, it is unfair and unrealistic to expect inquisitive musicians such as Conte to self-censor themselves out of the loop. On the contrary, we should welcome them joining in. Bring it all onand judge each case on its merits. Track Listing: Uhuru Na Umoja; Ogun; Cosmic Peace; Universal Rhythm; Mystic Revelation Of The Gods; Let Your Light Shine On; Space Dimensions; Tribes From The Unknown; Me Do Wo; Essence Of The Sun; Love Power; Afro Black. Personnel: Nicola Conte: guitars; Bridgette Amofah: lead and backing vocals (1, 3, 4, 9, 11, 12); Carolina Bussico: lead and backing vocals (1, 3, 7, 12); Zara McFarlane: lead and backing vocals (2); Zoe Modica: lead and backing vocals (6, 10); Gianluca Petrella: trombone, Mini Moog; Logan Richardson: alto saxophone; Magnus Lindgren: tenor saxophone, flutes; Theo Croker: trumpet; Pietro Lussu: piano. Vox organ, Wurlitzer electric piano, Fender Rhodes; Luca Alemanno: double bass, electric bass; Teppo Makynen: drums, percussion; Abdissa Assefa: congas, percussion; Tommaso Cappellato: drums (5); Nduduzo Makhathini: Fred Rhodes; Tumi Mogorossi: drums; Tlale Kakhene: percussion (8); Seby Burgio: organ (9, 11); Mike Rubini: baritone saxophone (9).